This is according to Premier Job Mokgoro, one of the speakers at the recent inaugural TEDx event that took place on the North-West University’s (NWU’s) campus in Mahikeng. Themed “Pathways”, this event aimed to get conversation going on how the North West province could come together, learn from its rich history and take bold steps forward for the improvement of the province and its communities. TED is a nonpartisan non-profit organisation devoted to spreading ideas, usually in the form of short, powerful talks. TED began in 1984 as a conference where technology, entertainment and design converged, and today covers almost all topics — from science to business to global issues — in more than 110 languages. Independently run TEDx events help share ideas in communities around the world. These live talks on local issues are video-taped and made accessible to everyone around the world. TEDx ambassador for Southern Africa, Keloabetswe Kubu, says the focus of the event was on learning about all cultures and taking the opportunity to tap into new ideas. "We film the TEDx talks and load them on the internet, and we hope to include more video clips about agriculture, health and mining, among others in future." "TEDx relies on community support. We hope the university and the North West community will show their support and contribute to the TEDx programme," she says. 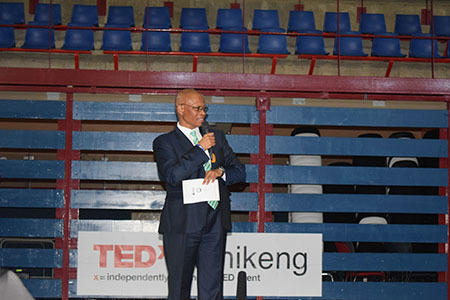 Chief Justice of South Africa, Mogoeng Mogoeng, delivers a talk at the inaugural TEDx NWU event in Mahikeng.